Can China Catch a Cool Breeze? The planet's future depends largely on the fate of China's nascent wind sector. On a range of seaside mountains between Shenzhen and Hong Kong, two visions of China’s future development stand side by side. The slope of the mountains is busy with construction workers building roads and swank modern trophy homes, each with a two-car garage. The valley below is carpeted with acres of bright green chemical-fed golf courses, their sand traps winking up in playful floral patterns. This is the future as California-style, auto-based sprawl. On the ridgeline above this stands the other vision: four tall wind turbines face the South China Sea, receiving the steady ocean breeze. The turbines of the Da Mei Sha wind farm are part of the country’s rapidly rising renewable energy sector. This small wind farm represents an alternate future: that of China as a green technology giant. The People’s Republic of China faces two problems that could be addressed with one solution. The global economic crisis has hit China hard. The country’s exports and Gross Domestic Product growth have dropped dramatically; over the past year tens of thousands of factories have closed, and an estimated 20 million workers have lost their jobs. Social unrest is growing, and many fear it could spin out of control. In the face of that, China must boost its internal investment and consumption. In other words, China, which exports much of its savings, must absorb more of the surplus it generates–it must stimulate its own economy. The Chinese government’s $585 billion stimulus package, announced in November and dedicated mostly to infrastructure, is an attempt to do just that. A second, equally massive intervention may be on the way soon. At the same time, China faces an array of interconnected environmental crises. Foremost among them is air pollution caused by heavy use of coal. For the unconditioned foreigner (such as your reporter) who shows up in the leaden, acrid filth of an overcast day in Beijing or Chonqing, the physical effects can be immediate headaches, nausea and disorientation. Even much of rural China is choked by this poisonous, soot-laden air. Coal pollution is estimated to cost China at least 7 percent of its GDP annually in lost productivity. A recent Pew survey in China found that more than 70 percent of respondents said air quality was a serious problem; water quality is seen as equally dire. Desertification and severe water shortages are beginning and will get worse as Himalayan glaciers disappear and rainfall is disrupted by climate change. Later this century, a rise in sea level is predicted to inundate many coastal cities and much of the country’s industrial base. The mountainside sprawl, repeated in variations all over China, might work to stimulate the economy. But environmentally it will bring disaster. On the other hand, retooling the energy system–à la the windmills–could solve both problems by radically reducing the country’s carbon emissions while stimulating the economy. Not long ago, Chinese leaders refused to confront the environmental crisis, claiming that renewable energy was too expensive. They argued that because most accumulated atmospheric carbon dioxide emissions were produced by the industrialization of the United States and Europe, it is therefore unfair to expect China to sacrifice its economic growth to solve a problem created by others. This argument may be historically “correct,” but it is also suicidal: runaway climate change will not exempt China or anyone else. Recently, however, China has begun to embrace renewable energy. And it is clear that the economics of renewable energy make sense. Wind farms, in particular, involve considerable economic benefits like rapid growth, job creation, technological links to the rest of the economy and lots of profits. Solar, hydro and biomass are also being invested in, but wind power is the most robust of China’s renewables. China built its first wind farm in 1986, after some engineers visited the United States, saw West Coast wind farms and bought a few turbines. For the next decade and a half, wind development moved very slowly, but the pace picked up during the tenth Five-Year Plan, which began in 2001. By 2005, China had built fifty-nine wind farms, with an installed capacity of 1.2 gigawatts, making it the world’s eighth-largest producer of wind power. Today China is the fourth-largest producer of wind power, its installed capacity having increased by more than 800 percent in four years. Capacity is expected to double again, to 20 gigawatts, in two years. The government’s goal for 2020 is to meet 15 percent of its energy needs with renewables, and wind will be a big part of that. But a recent Greenpeace study was even more optimistic, arguing that China could build 122 gigawatts of wind capacity by 2020. That would be the equivalent of five Three Gorges Dams or a score of nuke plants. How has China achieved this rapid growth of its wind sector? In many ways the story follows the classic trajectory of East Asia’s dirigist–that is, state-directed–hothouse industrialization. Far from letting the market do its thing, the state has worked diligently to protect and discipline private businesses involved in the wind sector. Government economic planners view the wind sector as an opportunity to build up high-value-added domestic manufacturing. China’s industrial policies are particularly instructive for those of us in the United States who would like to see our own renewable energy sector grow more robustly. Until very recently the US model, or lack of a model, for wind development has been to leave the work to the private sector. There are no national “portfolio standards,” or mandates, requiring utilities to supply a specific amount of energy from carbon-neutral sources; and until the passage of the American Recovery and Reinvestment Act of 2009 there was very little subsidized financing for green energy projects or even a robust use of eminent domain to force wind projects through over the objections of NIMBY landlords. The main form of government support has been an anemic production tax credit of 1.9 cents per kilowatt-hour. But even this support has been allowed to expire and has been renewed for only one or two years at a time. As a result, our renewable energy sector is hostage to the panicky gyrations of bubble-and-bust cycles of speculation. And with the current downturn, alternative energy projects are starved for capital. 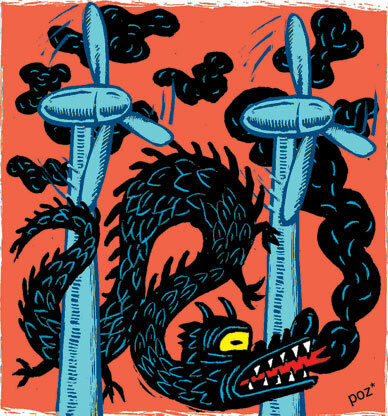 China, on the other hand, has used all the powers at its disposal–regulations, mandates, tax and tariff reductions, and direct subsidies–to nurture and incubate its wind sector. At the heart of the process is the National Development and Reform Commission, China’s central government planning body. Most Chinese wind farms start with NDRC research, which locates the asset–namely, the windy land to be developed. The government then portions out pieces of this windy terrain to Chinese firms, some of which are partnered with foreign companies. Officially, the contracting process uses competitive bidding, but in reality the process is often opaque and not always governed by formal rules. Rather, it is guanxi–connections, networks and solidarity–that determines who gets what. One common loophole has to do with the size of a wind farm. Those farms below 50 megawatts do not require any competitive bidding and can be developed by local governments. “It is pretty common to sees lots of wind farms of 49 megawatts stacked to three and four next to each other,” says Joanna Lewis, an assistant professor at Georgetown University and a specialist on the Chinese wind industry. Once developed, the wind farms are usually sold to local utilities to operate them. Chinese law requires regional utilities to buy all renewable energy at favorable above-market prices. Turbines and generators, the most complicated parts of the wind industry, are increasingly supplied by Chinese firms. China jump-started its turbine production by purchasing technology licenses from European firms. In the early years the government mandated that 40 percent of wind farm components be locally manufactured. That requirement has risen to 70 percent. This forces the best turbine manufacturers–like Denmark’s Vestas, Germany’s Nordex, Spain’s Gamesa and US-based General Electric–to build high-tech factories in China or face exclusion from the booming Chinese market. There are by one count about a dozen major wind turbine and generator manufacturers in China, two of which, Goldwind and Sinovel, are considered to be among the ten biggest in the world. Both are partly state-owned. In the case of Goldwind, the government owns 55 percent. Financing at every stage is marked by state subsidies and low-interest bank loans. The strategic nature of energy, and perhaps the government’s heavy involvement, gives the Chinese wind industry a surprisingly secretive, almost paranoid, culture. Touring wind turbine factories is nearly impossible, and even getting permission to visit wind farms is maddeningly difficult. Another flow of subsidies comes from abroad through the Clean Development Mechanism (CDM) of the Kyoto Protocol to the United Nations Framework Convention on Climate Change. The Kyoto Protocol famously set carbon reduction targets: most industrialized countries agreed to cut their greenhouse gas emissions 6 percent to 8 percent below 1990 levels by 2012. One of the ways rich economies can meet some of their reduction targets is by paying for green energy projects in poor economies. This North-to-South subsidy scheme is the CDM. “In China about 100 percent of wind projects get CDM subsidies,” says Joanna Lewis. With almost 300 CDM-registered projects, China accounts for about one-quarter of the program’s total capacity, which transfers about $5 billion a year from wealthy industrialized economies to developing economies. Critics of the Clean Development Mechanism charge that China likely would have developed many of these renewable energy projects even without the subsidy. But experts like Houser and Lewis say that CDM funding has been crucial to jump-starting Chinese wind power. They point to the fact that every major green energy project in China has involved such funding, and that without CDM money it is likely that other capital would be harder to raise. In China two state companies own the electric arteries that connect the pieces. The larger of these is called, in the inimitably practical nomenclature of socialism, State Grid. Rebuilding and upgrading the grid has lagged far behind the country’s runaway electricity demand and generation capacity. The weakness of the grid became painfully clear this past winter when heavy snows snapped crucial links and plunged much of the nation into freezing, chaotic darkness. Yet China is stepping up to the challenge of fixing its rag-tag transmission network. State Grid has started building long, ultrahigh-voltage direct-current lines. By 2020 there should be fifteen of these massive corridors linking industrial and urban China to its various power sources. “In the US one major transmission line could take ten years to build, between the financing and planning and legal challenges. But in a command economy like China, they’ll do it very quickly,” explains Houser. China is also trying to ease demand. In 2006 it kicked off the world’s most aggressive energy-efficiency program, and by 2010 China aims to cut its “energy intensity”–energy consumption per unit of GDP–by 20 percent. This would produce carbon dioxide emissions reduction almost five times greater than the entire European Union is committed to achieve under the Kyoto Protocol. Part of this program involves decommissioning hundreds of smaller, older coal-fired power plants. Nonetheless, the story of China and climate change is pretty grim. The country is an economic, demographic and political giant that is in many ways falling forward. As long as it catches itself, this looks like progress, but as soon as it stumbles it faces a potentially catastrophic collapse. The main problem is the dirty black rock. Coal provides about 80 percent of China’s electricity, and the country is a net importer of it. The race to escape coal and to avert the worst impacts of carbon emissions is, as of now, feeble, even quixotic: renewable energy is simply not growing fast enough. “Beyond 2020 we could start to see a real paradigm shift; the energy mix could really move away from coal,” says Houser, “but not before then.” That, unfortunately, is not a time frame that will avert disaster–for China or the world.